Capture the style of calla lilies at your wedding reception without spending a fortune. 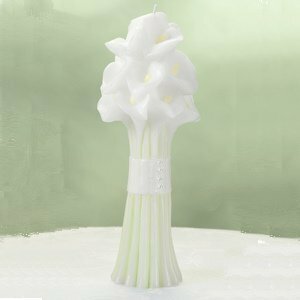 Each beautiful 10" tall pillar candle is colored wax in white, greens, and yellows, all made to look like a bouquet of calla lily flowers. They're the perfect size and design to adorn your tables at the reception. Guests will love to take them home. Coordinates beautifully with other items available here in the calla lily design including guest book, pen, candle holder, ring pillow, and toasting glasses. 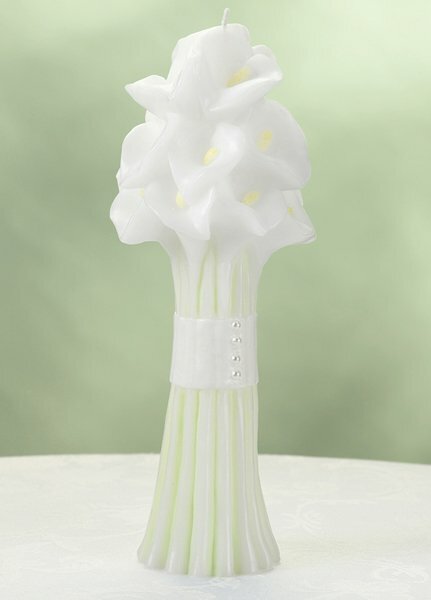 Use the motif of this one elegant flower throughout and your wedding will be a garden of pure delight.